A simple conversation at a family dinner back in 2008 changed the life of Justin Johnson as he knew it. At the time he was just a sophomore in college talking with his stepdad, a hockey referee, who presented the idea of creating a helmet liner that soaked up your sweat so it wouldn’t drip down your face. After finding nothing like it in the market, Justin and his brother spent the next several years researching, patenting and manufacturing their custom liners and the NoSweat brand was born. Justin Johnson, center and the NoSweat executive team display their patented liners. While simultaneously going to college and building a company proved difficult; hard work, perseverance, and marketing savvy grew what initially started in a basement into a multi-million dollar business. Today NoSweat is lifestyle brand, and manufacturer of products built to increase performance, safety, and hygiene for anyone who sweats and wears hats, helmets, visors, or hard hats. Justin’s patented moisture-wicking liners are worn by everyone from weekend golfers and construction workers, to competitive horseback riders and NHL players. Yup, that’s right! 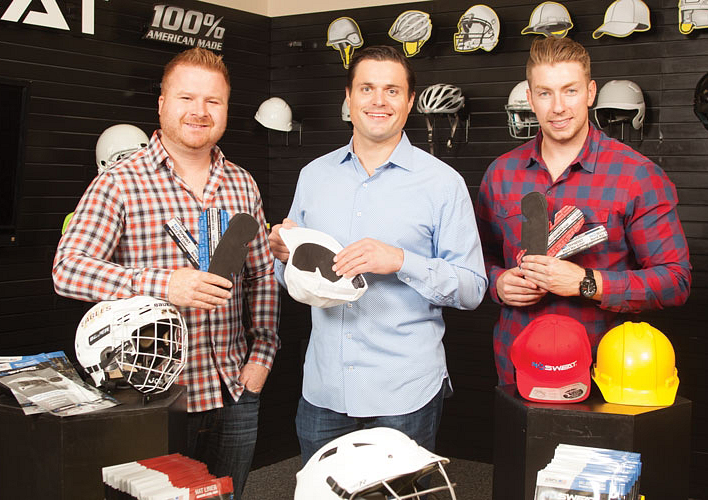 32 professional NHL teams and the NHL Officials Association proudly sport NoSweat liners in their helmets. The company has also secured endorsement deals with multiple professional athletes including TJ Oshie of the Washington Capitals (2018 Stanley Cup Champion), Dallas Keuchel of the Houston Astros (2018 World Series Champion), Matt Adams of the Washington Nationals, Golden Tate of the Detroit Lions (Super Bowl 48 Champion), Brandon McManus of the Denver Broncos (Super Bowl 50 Champion), and PGA Open Champion Stewart Cink. And most recently, NoSweat became a licensed partner of the PGA Tour! NoSweat’s golf hat liners are top sellers on Amazon. For the last two years, Justin and his team have utilized MerchantWords to optimize their product listings and find the perfect keywords for their Amazon Sponsored Ads and Headline Search Ads. 1. Use MerchantWords to find high volume and relevant keywords. Place the highest volume keywords in the title, avoid duplicating keywords, and maximize every relevant keyword Amazon allows. 2. Use powerful main images to grab consumer attention. 3. Optimize your listings for both desktop and mobile customers. 4. Research category and competitor listings to help identify what works. 5. Use every keyword possible throughout your title, bullets, and description. 6. Sponsored products ad campaigns can increase sales. 7. Try using coupons and sales prices. 8. Lightning deals can help drive quick momentum. 9. Giveaways are great assets for new launches. NoSweat’s patented sweat-wicking liners are available for hats, visors, hard hats and helmets, with youth sizes coming soon. You can find NoSweat products on Amazon and at NoSweatCo.com.